A picture thought to have been hand carved by Sir Isaac Newton has been discovered on a wall at his childhood home in Lincolnshire. 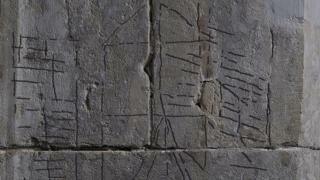 An etching of a windmill was found following an investigation of Woolsthorpe Manor, near Grantham. The famous scientist was born at the house in 1642 and later returned to live there during the 1660s. It is claimed that it was in the garden that he observed the falling apple that led to his theory of gravity. Researchers used Reflectance Transformation Imaging (RTI) technology to reveal the image, which was next to a fireplace. RTI records reflected light from different angles to build up a photographic image that can show hidden details. Chris Pickup from Nottingham Trent University, who led the survey, said he hoped other drawings would be discovered. "It's amazing to be using light, which Newton understood better than anyone before him, to discover more about his time at Woolsthorpe," he said. "I hope that by using this technique we're able to find out more about Newton as man and boy and shine a light on how his extraordinary mind worked." The picture is not the first to be discovered at the property, which is now owned by the National Trust. Several sketches, thought to be his, had previously been uncovered by tenants removing old wallpaper in the 1920s and 1930s. The new discovery will form part of an exhibition at the house that runs until February.